Although there are many different brands and types of electronic cigarette models in the market today, most are basically built on the same concept as shown below. The main process of inhalation is slightly different from a regular tobacco cigarette. Instead of a quick draw like you would take from a regular tobacco cigarette, you should take a long, slow draw from an electronic cigarette. A long, slow draw gives time for the vapor to be produced once the activation button is pressed. Below we list the various components of an electronic cigarette in hopes to educate consumers. The battery is what powers the electronic cigarette. Most eGo batteries are rechargeable lithium-ions that make use a small circuit board inside, which have fail safes for overheating and overcharging. A majority of eGo batteries possess an LED activation button that lights up when the electronic cigarette is activated. The threading at the top of the battery is usually eGo (big outer thread) and 510 (small inner thread) to allow numerous atomizers/cartomizers and tank systems to be compatible. You can turn the eGo battery off/on by pressing the LED activation button 5 times within 1-1/2 seconds. As with most lithium-ion batteries, you should never let the charge get below 10% power capacity. The atomizer is where most of the action happens. 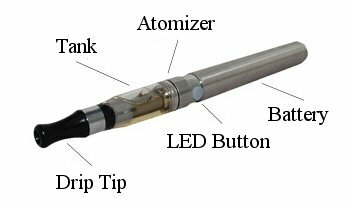 The e-liquid is simply heated by the atomizer, thus producing vapor. Some tanks require atomizer coils, while others use cartomizers. All are basically the heating element of the electronic cigarette. Atomizers usually contain wick material along with a metal coil. Cartomizers are typically small metal cylindrical tubes filled with wick material. Inside the cartomizer is a wire with heating coils that run through the wick material. Coils like those used in the ARO tanks are typically enclosed heating elements. Most atomizers need to be replaced between 1 to 4 weeks depending upon usage. The tank serves as a reservoir for e-liquid. Tanks come in many different colors, shapes, and sizes. You fill your tank with e-liquid and are able to vape for hours. Earlier versions of electronic cigarettes only possessed small cartridges that would not last very long. Examples of tanks: DCT (Dual Coil Tank), Vivi Nova, and Clearomizer. The drip tip acts as a mouthpiece and sits atop the tank. They come in many different colors, shapes, and sizes. The functions of the thread collar are to make the electronic cigarette look uniform and to protect the threads. Some vapers do not use the thread cover, since it tends to get in the way when removing the tank. The thread collar screws onto the battery and rests between the battery and tank. Most e-cigarette users prefer the taste of e-liquid compared to traditional tobacco cigarettes. Eliquid comes in many different flavors and nicotine strengths. 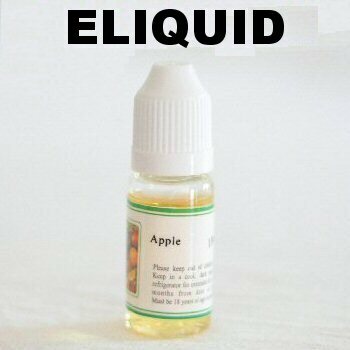 E-liquid comes in various bottle sizes, such as, 10ml or 50ml. Some users start with a high nicotine strength, such as 24mg/ml (usually abbreviated 24mg), then decrease their nicotine intake over time. E-liquid is comprised of water, propylene glycol, vegetable glycerin, flavoring, and liquid nicotine. Some e-liquid (0mg) does not contain nicotine. Propylene glycol (PG) and vegetable glycerin (VG) are added to e-liquid for sweetness and vapor production. Both are common food additives that have been approved by the FDA. Every vaper must have a USB charger. This is the device that connects your battery to other charging adapters. Small and lightweight, the USB charger plugs easily into your desktop PC, laptop or any USB power source. If you spend plenty of hours in front of a computer, then this is the most convenient way to charge your electronic cigarette battery. Just screw in the battery into the charging slot and plug it in to your USB port. The indicator light will glow red while the battery is charging and turn green when it is fully charged. The wall charger is a 2-pronged device designed to work with home electrical outlets. Make sure that the unit is compatible with your country’s standard voltage before using. To begin charging, screw the battery into your USB charger and then connect that into your wall charger. Plug the wall charger to your wall outlet.